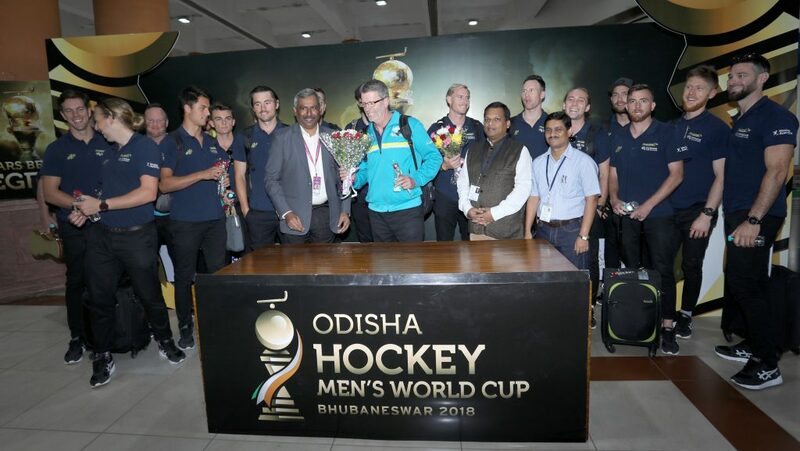 Bhubaneswar (Odisha), 24 November 2018: Going by the words of Captain Aran Zalewski, Australia are under no pressure to defend their title as it’s a home-coming for the World No. 1 team. Arriving in Bhubaneswar on Saturday afternoon, the team looked composed and confident ahead of their title defence campaign. Australia definitely know a thing or two more about winning in Bhubaneswar as they claimed the Champions Trophy in 2014 and the Hockey World League Final in 2017. Zalewski said they are happy to be back in the City Of Temple. “Definitely, we have a chance to test ourselves against the best in the world as we haven’t tested ourselves since Rio (2016 Olympics) so we want to do very well here,” said Zalewski speaking to media after arriving at the Biju Patnaik Airport. The defender also agreed that this was one of the most open World Cups in recent times. “World hockey is close at the moment and very competitive and any team can win and obviously India at home with home crowd will be very tough to beat,” said Zalewski. Head Coach Colin Batch also said it isn’t going to be an easy task for his side even in Pool Stages. “We are the Champions but a long way from winning this tournament. We have a lot of work to do. We saw that in the Women’s World Cup, a lot of surprises sprung up so we have to perform at our best against Ireland in the first game and then see what happens from there,” said Batch, a World Cup winner himself in 1986. Australia has Ireland, England and China in Pool B and Coach feels they need to play good hockey to beat these sides. “We haven’t seen Ireland for a while but they have played some good hockey. England we have played them a few times, they are a good side and China are a bit unknown so we just take one game a time,” said Batch. Australia open their title-defence campaign against Ireland on 30 November 2018.